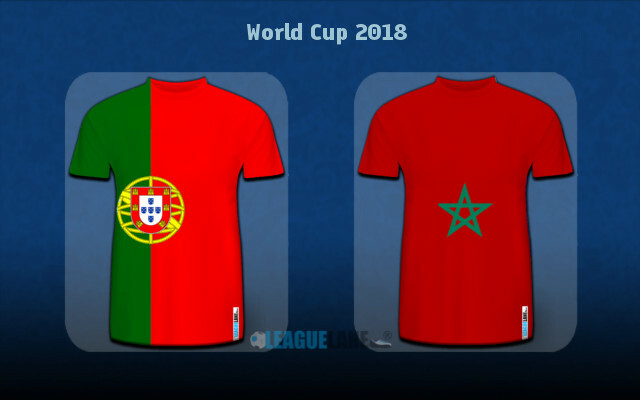 The Russian capital will play host to the second round of the Group B match as Portugal and Morocco take on each other battling it out to save hopes for qualifying to the knockout stage. Portugal come into this off the back of a 3-3 draw in a high-scroing thriller against the Iberian heavyweights Spain. They’ll have a completely different side to tackle in the second round with Moroccan rock-solid defensive line expected to cause them a host of troubles on the day. Morocco were the successful side in their lone previous head to head encounter at the 1986 World Cup. Cristiano Ronaldo and co. obviously enter this game as pretty clear favourites, especially after the superb effort put on against Iberian rivals Spain on the second day of the tournament. Morocco conceded a last-gasp goal to get away from the opening round tie with Iran; empty-handed in spite of the promising start to the affair. The North Africans now have a mountain to climb in what is a must-win clash against Portugal on Wednesday afternoon. Nevertheless, beating the solid African outfit will by no means be a piece of cake for the Portuguese outfit. The good news for Portugal fans is that they have a high-profile head coach in the like of Fernando Santos on the bench. The man who had earlier instilled the impressive discipline into Greek’s national side led Portugal to the EURO silverware two years ago in France. Fernando Santos certainly knows how to motivate his men ahead of such an important second round tie. His colleague on the other side, Herve Renard, will have a much tougher challenge doing so after the Atlas Lions shipped a goal in the fifth minute of the stoppage time in the first round match against Iran. It was Aziz Bouhaddouz who headed the ball into his team’s own net after a set piece to produce a goal that made all the difference between the group underdogs, leaving Morocco with super slim chances of progressing to the last 16. In spite of scoring three against Spain, Portugal did not show the creativity with Goncalo Guedes as Ronaldo’s partner up front. Besiktas’ star Ricardo Quaresma could get more minutes on the pitch here. Bernardo Silva disappointed in the clash against Spain and Portuguese fans certainly expect much more from him against Morocco. The defensive line with 35-year-old Pepe and 34-year-old Jose Fonte looks to be extremely vulnerable. Patricio – Pepe, Fonte, Soares, Guerreiro – Bernardo Silva, Joao Moutinho, William Carvalho, Bruno Fernandes – Guedes, Ronaldo. Herve Renard should not make changes to the squad that played Iran on the opening day. The 4-2-3-1 formation could cause plenty of troubles to Portugal here. Team’s right flank is particularly dangerous with Nordin Amrabat and Hakim Ziyech producing a constant threat. Medhi Benatia and Romain Saiss once again showed a decent display at centre-back positions. Ayoub El Kaabi, who packed 11 goals in 11 internationals, is expected to lead the line once again. 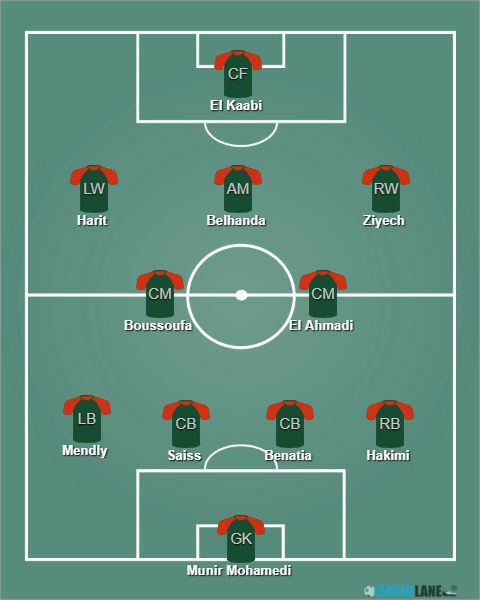 Munir – Mendly, Benatia, Saiss, Hakimi – El Ahmadi, Boussoufa – Ziyech, Belhanda, Harit – El Kaabi. The two teams took on each other just once in the past. Interestingly, the clash was also played at the World Cup, back in 1986 when Morocco took a shocking 3-1 victory in the group stage. The Atlas Lions topped their respective group back then with four points, while Selecao das Quinas ended at the rock-bottom with two draws in remaining fixtures. Portugal left a strong impression in the opening clash with Spain, but their defensive line proved out to be super vulnerable allowing three goals back then. The attack did not do much either, as odd as it sounds knowing the team bagged three goals against such heavyweights as Spain. However, Portugal had no more than three shots on target (five in total), Ronaldo providing them all. The first one came from the penalty-spot. The second would have never gone in had without De Gea’s shocking reaction, while the third one was a genuine screamer after a beautifully taken curved free-kick shot from the Real Madrid star. Santos’ men will be up against a completely different mind-set here as the Atlas Lions will sit at the back and waiting for their chances from counter-attacks. They do have players to respond well to such strategy in the likes of Nordin Amrabat, Younes Belhanda, Amine Harit and Hakim Ziyech. The North Africans had to attack looking to break Iran down in the first match. They’ll play completely different this time out and we’d not be surprised to see them perform very well and even get a result here. Moroccan defensive line shipped no goals at all in six qualifying affairs en route to the World Cup in Russia and they’ve been tough to break down in friendlies later on. We’ll go with Morocco or Draw Double Chance at the 2.40 odds as the main betting option here, while you can alternatively back the Under 2.5 goals full-time at 1.72. The Predicted Full-Time Result is Morocco clinching a narrow 0-1 victory in what could be a tough affair for Cristiano Ronaldo and company. Morocco or Draw Double Chance @ 2.40. Correct FT Score: 1-0 Morocco @ 15.00.